You spend a lot of your time on the computer, reading emails, checking blog updates, avoiding work, and drowning in a sea of information. The problem is, so does everyone else. The tired minds you need to find to sell product are sick of old sales tactics, yearning for something new to turn their Internet browsing drudgery into something enjoyable. Fortunately, your sales team and your business have a new weapon at their disposal. Through the time-tested medium of video, your presentation, connection, and image can receive a boost, leaving boredom in the dust. We’ve all seen that garden gadget or car accessory that promises to make life easier. Problem is, without seeing it in action, those portents of easier lives and smiling families have little to stand on. Customers need to know that your product works, so what better way than to show them? A product in motion, showcasing its effectiveness is a sure-fire sales tool. Consider any Nike commercial for new shoes or gear. The athletes run around the court or field, stretching the fabric, taking their lumps, and falling to the ground while the clothing remains intact. At the same time, you’re ogling that gorgeous running jacket, now firmly convinced that the new Nike wind breaker is precisely what your life needs. 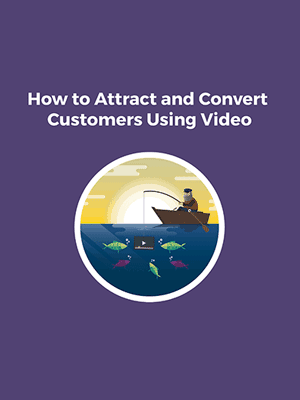 Give your wares life and prove their effectiveness and your video will become a conversion machine. There are two kinds of startups: those that grow from great means, and those that start from scratch. Unless you’ve got investment capital laying around, your new business and product need to get off the ground fast, and that means making an impact as soon as you appear on the market. A great launch video has turned young companies into cult hits overnight, showing that a little personality and a lot of heart can go a long, long way. Take Airbnb for example. Their memorable launch video gave nothing more than a simple explanation of the service, adorned with all the sensibility of a young traveler and the comfort of friendly strangers. Since that auspicious debut, the company has grown by leaps and bounds, buoyed by a smiling face and a strong first impression. Remember that trailer you saw the last time you went to the movies? The one that left you checking your calendar for the release date, even if you had no clue what the plot was? There’s a reason it worked, and it can work for your business too. New products mean new possibilities for customers, and nothing builds enthusiasm like a little tension. Got a new release coming out at the end of the month? Don’t drop the release on unsuspecting viewers; whet their appetite with a little hint that’ll generate buzz and get people excited. A silhouette, a vague question, and a new logo can all leave audiences guessing, even if they have no idea what they’re in for. Thanks to YouTube, Vine, and that little camera we carry around in our pockets, everyone is a video producer these days. Heck, even breakfast at Denny’s can turn into a sharing opportunity if the amateur director feels so inclined. This reality is beneficial for more than just egg enthusiasts; your firm can turn a simple video into a vivid conversation. Go viral with a mind-blowing product demonstration or conversation piece and solicit feedback from your viewers. With cameras constantly at their disposal, you’ll give brand evangelists a chance to shout it from the rooftops, while encouraging more reserved customers to showcase their creative side. Offer a prize for the best submission and showcase the best vids. Pretty soon you’ll have a full-fledged video-fest on your hands, and no one’s balking at that. People love an underdog story, particularly when that underdog is our favorite business. Every purchase we make feels like a chance to support the good guys, toiling in their workshops or offices, diligently crafting an experience that benefits us directly. A behind the scenes look at your business invites customers into the fold, giving your storefront life and breathing the fresh air of community into your customer engagement. Trunk Club, for example, produced this video, which shows stylists hand-picking clothing, hand-packing it in boxes, and hand-delivering it to happy recipients. The net result of this short clip is the feeling that a call to the scrappy upstart is, in essence, a human connection, fostering the generosity and enthusiasm of their most devoted patrons. When you’re done putting the finishing touches on your carefully crafted product, put it out in the public and push it toward success through video. A strong product demonstration or launch video helps put your brand in rosy light, while engagement opportunities and behind-the-scenes videos connect you to your customers like never before. Scrap that boring old copy you’re working on and use video today. We get the feeling you’ll be happy with the results.